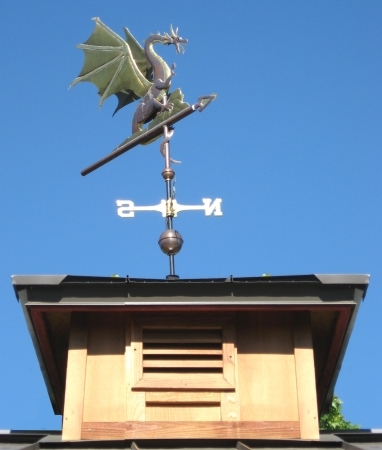 The Web Winged Dragon Weathervane is one of our favorite designs. 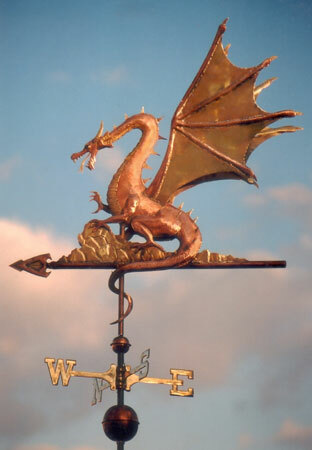 In fact, we have a medium sized Web Winged Dragon weathervane in our personal collection and often proudly display it in our living room. I love the way the tail wraps sinuously around the mounting tube below the rocky crag on which the dragon perched! Other people seem to like it as well! We have crafted this particular dragon for customers all over the country. 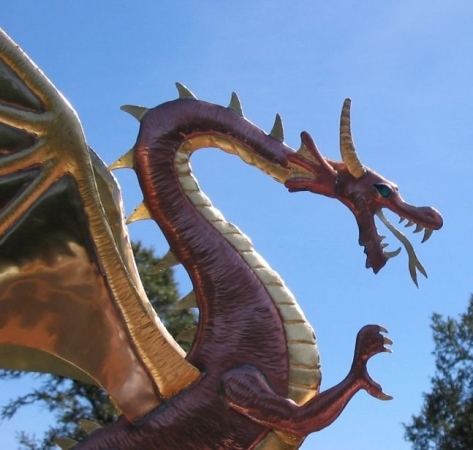 The copper Web Winged Dragon Weathervane featured here has translucent, topaz colored glass eyes. 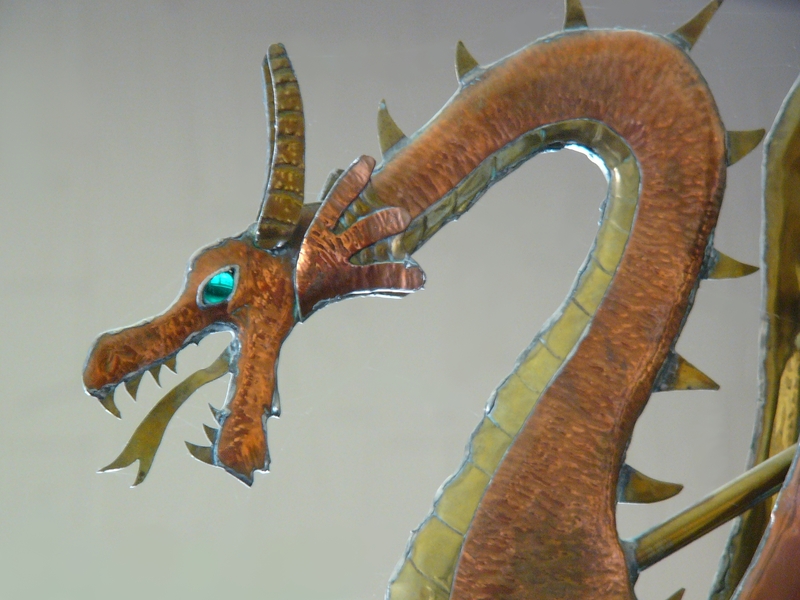 We have also made green-eyed, blue-eyed and emerald-eyed dragons, depending on our customer’s preference. 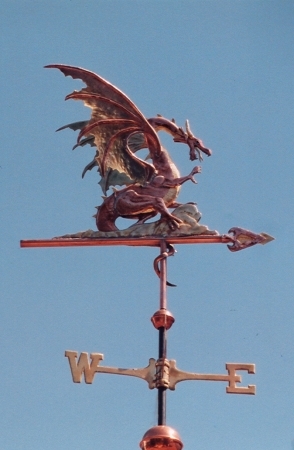 Included in the price of this weathervane are gold leafed teeth, tongue, horns, talons, wing claws, spines and belly. Optionally, we will also gold leaf the ribs in the dragon’s wings or the actual wing panels between the ribs for an even more dramatic look. 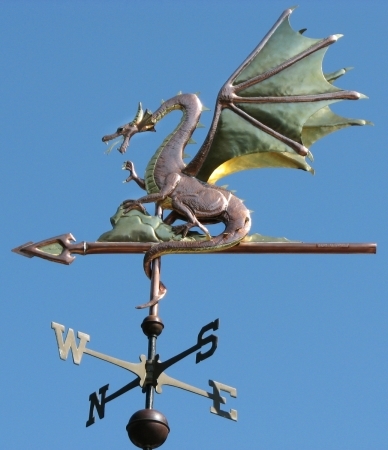 A number of customers have paired one of our dragon weathervanes with our Rearing Steed with Knight Weathervane. 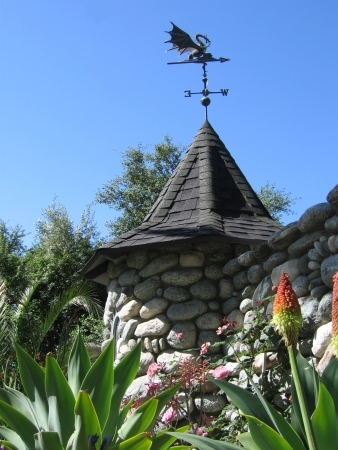 In one case, the two weathervanes were placed nearby on two adjacent roof gables. When the one blew one way the Knight courageously challenged the fearsome dragon. However, when the wind blew the opposite direction, the dragon got its chance to chase the fleeing knight! If I recall correctly, the customer also put night-lights up on the roof to display the ongoing drama as it played out under the stars. Perhaps Ladon, the dragon from ancient Greek mythology, is looking down from the constellation Draco, rooting for his fellow dragon! 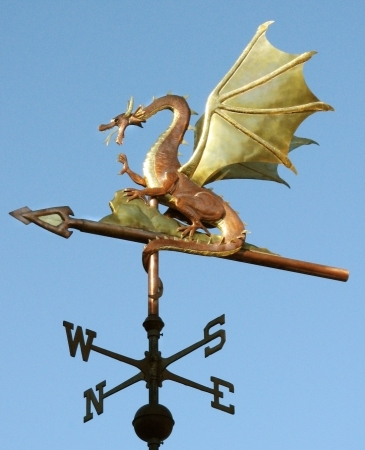 Another popular design is our Roc Dragon Weathervane, famed original monster from the iconic Dungeons and Dragons role playing game and (I love this part) hostile to creatures of Chaos and Neutrality! 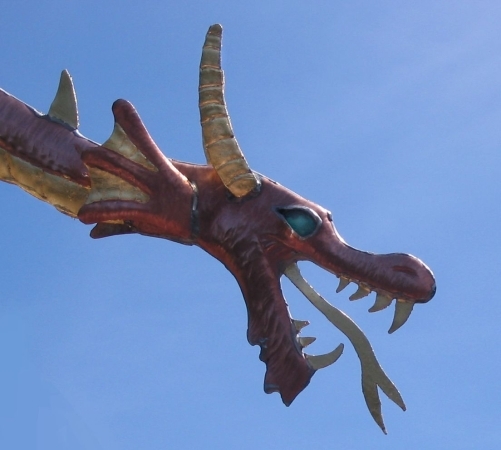 Another fun project was making a Web Winged Dragon Weathervane for Joanne Bertin, author of the Dragonlord series. 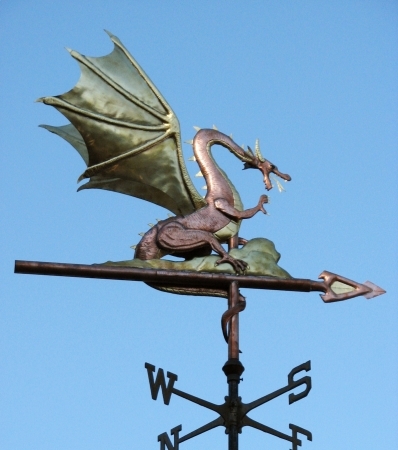 This weather vane was commissioned by one of her best friends as a special gift. 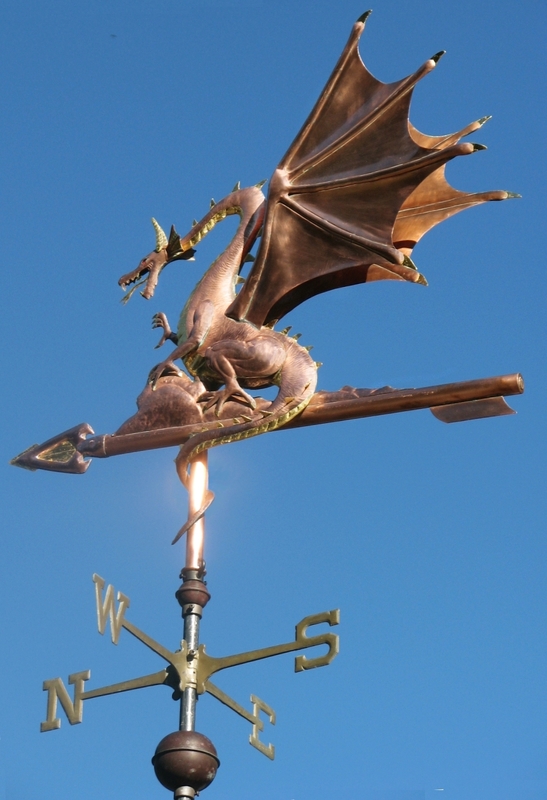 Because her friend was nice enough to order one of our weathervanes as a gift, he was pleased to know that he qualified for our Lifetime 10% Discount should he ever decide to order one of our weathervanes for himself. 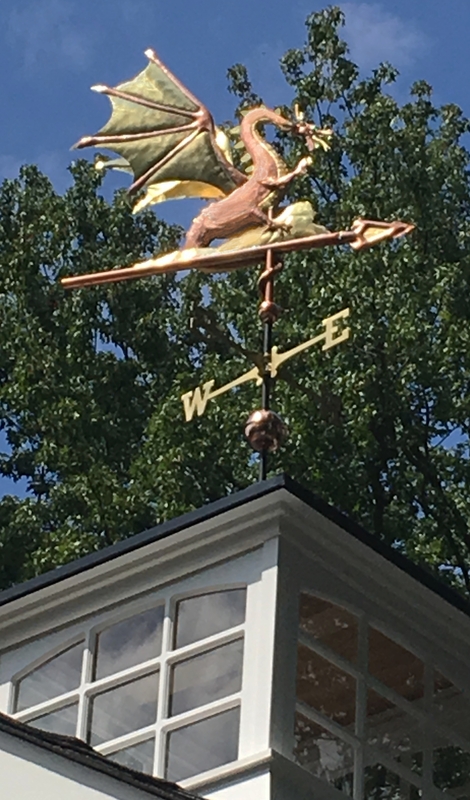 Other customers have cited a deep and abiding affection for “Puff” the Magic Dragon or “Smaug” from J.R. Tolkien’s wonderful book, “The Hobbit” as reasons for selecting this weathervane design. 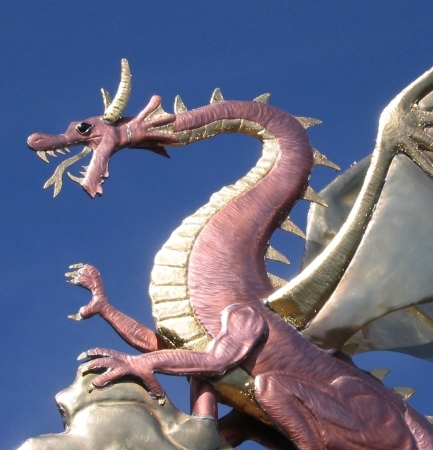 Although it looks spectacular showcased on top of a cupola or turret, it is also ideal for a more intimate setting such as a garden or even an indoor perch where you can see all the details of its scales and the spikes running down its spine. 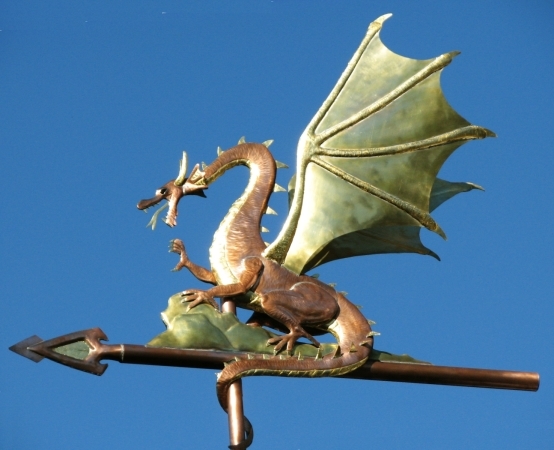 When the weathervane is placed outside the copper will first weather a rich chocolate brown and eventually take on a green patina making it look even more like a “real” dragon!